Horizontal Flow Wrapper (HFFS) that makes a three sealing pillow pack with high performance level. ULMA as a packaging manufacturer leader, is now providing an electronic motion control in all its new versions on the ATLANTA family. 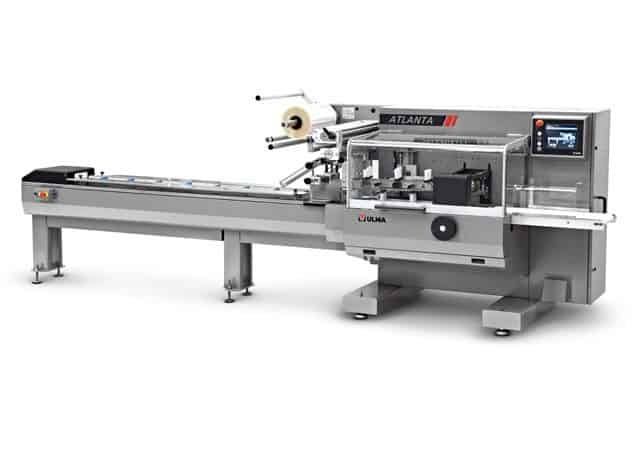 The new version of the ATLANTA machine includes a motion control system to the well known and established ATLANTA Horizontal Form Fill and Seal (HFFS) Wrapping machine. This new version provides new features to the machine keeping its well known high reliability. This model features the main characteristics of other ULMA machines such as strength, ease of operation, and reliability. In addition, it also features an ergonomic cantilever design that makes cleaning and sanitising easier. It is also possible to integrate many different automatic and semi-automatic feeders. The result is the new ATLANTA, a solution for medium to high production demands, and for any automatic line that requires a HFFS automatic wrapping machine. Al Thika Packaging is the exclusive distributor of ULMA Packaging company in the Middle East. Since 1994 Al Thika has been supplying packaging machineries including flow pack (HFFS), vertical wrapping (VFFS), tray sealing, thermoforming, stretch film wrappers and sealing machine for food and non-food industry in Dubai, Abu Dhabi, Sharjah, Fujairah, Ras Al Khaimah, Ajman, Umm Al Quwain, Al Ain – UAE, Saudi Arabia, Muscat, Oman and the many other Gulf countries. Cantilever construction that provides for easy cleaning and maintenance, with easy access to mechanical and electrical components. Rotary cross sealing jaws with an electronic overload safety switch. Self-centring film reel holder with a dancing arm operated brake system. Infeed conveyor 2 meter (6½ ’) long. Machine parameter settings (bag length, pusher position,… ) via the touch screen control. 5″ Touch screen setting of machine parameters, visible operational status and error messages. The control allows data storage for up to 99 different machine set-ups. Conveyors with various lengths and types are available. “Misplaced product – Double Bag” function. Photoelectric sensor for centering of print registered film. Double self centering reel holder. “D-Cam” type jaw version for laminated films.